The Martin Trust Center’s philosophy behind what we do can be summarized by a few simple concepts. We also offer a wealth of resources and initiatives for students to immerse themselves in entrepreneurship outside the classroom. Once a student wants to become an entrepreneur, he or she must know what to do. What are the proper steps to follow? This is where the frameworks, courses, and theory come into play. And while entrepreneurship is a craft and not a science, the Trust Center aims to ensure our students know what the most intelligent first principles are for moving forward. Knowledge is not enough and won’t be impactful unless it is turned into action and real-world capability; this is what we constantly seek to do with our programs. We always link theory and practice as MIT guides us to do with its motto “mens et manus” (mind and hands). There is a continual back-and-forth between the head and the hands in all our programs. Probably the most overlooked and possibly the most important for creating sustained, leverage and robust entrepreneurial growth is to become part of a community. In our offerings, we seek to teach our students how to be good members of vibrant communities and do this by making the Trust Center an example of one where they can benefit in the short, medium, and long terms. The second guiding principle for our programs is visualized in the Trust Center logo – an integrated ramp to escape velocity. We continually seek to create a continuous path for our students to start with low friction, easy-to-handle courses and programs and then, as they proceed forward, the courses and programs become more rigorous and demanding, but also rewarding, as each is built off what has come before. We constantly look for possible gaps in our ramp and work to ensure all offerings are integrated to make the progression more logical for the students. The ramp is also customizable for those who have different interests, but even these specialized courses have a common base and set of processes. This allows the Trust Center to be more productive, and, more importantly, it promotes valuable lateral learning for the students. Many start in one area and wind up in another, just as Julia Hu did when she first came to MIT for energy but ended up in healthcare instead. We make sure our programs support this path as well. 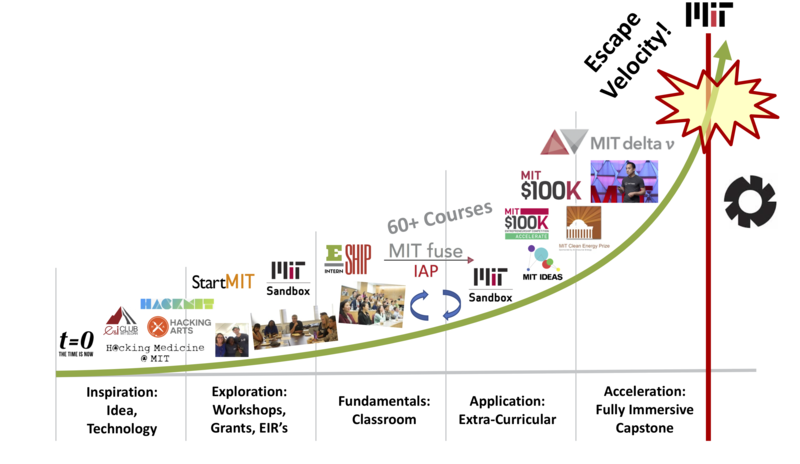 MIT delta v is MIT’s student venture accelerator, providing a capstone educational opportunity for MIT student entrepreneurs that prepares them to hit escape velocity and launch into the real world. MIT delta v takes the best teams with an interesting idea or proof of concept focused on creating impactful, innovation-driven startups. Teams are chosen from across MIT’s schools and spend three months working full-time at the center concluding with a Demo Day in September. The program is run out of two locations during the summer: the Martin Trust Center on the MIT campus, and the NYC Startup Studio in Manhattan. Sector Practice Leaders (SPL) help to address the unique challenges different industries present to entrepreneurs. While broad-based entrepreneurship education is useful, there is an additional need to provide knowledge to address key obstacles faced when starting companies in specific industries. Our SPL program focuses on four different industries. Student leaders for each sector were selected through a competitive process to develop plans and implement comprehensive, integrated, and cutting-edge programs such as advanced classes, active student clubs, annual conferences, business plan contests, hackathons, regular social events, guest speakers, and more. t=0 is a week of celebration for MIT Innovation and Entrepreneurship taking place at the start of every school year in September. MIT is known worldwide for innovation and entrepreneurship. t=0 is an event and exhibition that brings together MIT student clubs, startups, and organizations to showcase innovation and entrepreneurship in different sectors. MIT students from all MIT schools are invited to come discover some of the compelling work being done across industries, and to learn from other students how they can get involved in the MIT innovation scene. Our other Independent Activities Program offering in January is StartMIT, held for students who are interested in entrepreneurship in general and are looking for inspiration from speakers. The program also includes workshops that focus on the front-end of the entrepreneurial process such as mindset, ideation, and team formation. The Entrepreneurship Internship is a paid summer internship program open to ALL undergraduates at MIT and provides an immersive work experience at a startup founded by MIT delta v, MIT GFSA, or Beehive alumni. Students will be working side-by-side with the founding team and have an opportunity to work on meaningful projects, receive one on one mentoring, and determine if startup life is for you. MIT recognizes and rewards student excellence in entrepreneurship through several awards overseen by the Martin Trust Center. The McGovern Award is given at each year’s MIT Awards Convocation to an individual or team that has made a significant impact on the quality and overall spirit of entrepreneurship at the Institute in close collaboration with the Trust Center. The objective of the award is to motivate future student leaders, raise the profile of student-led organizations and reward individuals for outstanding achievement in building entrepreneurial excellence. The Monosson Prize for Entrepreneurship Mentoring, created to honor the memory of MIT graduate Adolf F. Monosson ‘48, recognizes entrepreneurship mentors who have committed their time, energy, and/or capital to future generations of entrepreneurs. Established at the MIT Sloan School of Management and made possible by Mr. & Mrs. William S. Grinker ‘56, the award continues Monosson’s mission of providing mentoring to will-be entrepreneurs. Monosson provided 55 years of valuable advice and counsel to classmates, clients, competitors, friends and students on starting and building entrepreneurial enterprises. He created more than ten businesses in the finance, publishing, computer, and leasing industries. Monosson also invested his time and capital in many other startup enterprises and mentored hundreds of existing and will-be entrepreneurs on the personal skills necessary for success. MEMSI is a two-week long, fully immersive mini-accelerator for aspiring hardware system innovators from universities in Hong Kong and MIT taking place twice annually in January and June. Work together to choose a customer problem to solve, understand the customer, come up with a solution, then build a prototype of this solution using advanced prototyping techniques. Build skills that will help them launch successful businesses later in life, including the Disciplined Entrepreneurship framework, Design Thinking, advanced maker skills, and more. See how mass production happens in real life during factory tours in Shenzhen, China. Present their business ideas and working prototypes to a panel of entrepreneurs, investors, industry thought leaders, alumni, and friends on Demo Day. MEMSI is powered by the MIT Hong Kong Innovation Node, the Martin Trust Center for MIT Entrepreneurship, Project Manus, the MIT MISTI China Program, and the MIT Innovation Initiative. MEFTI is the second program we help run in conjunction with the MIT Hong Kong Innovation Node, and is new for 2018. It is a one-week long FinTech startup bootcamp held in Hong Kong and Shenzhen for aspring FinTech entepreneurs. Students will experience the vibrant FinTech ecosystem in the Asia Pacific region and finding out what it takes to build a FinTech venture in an emerging market.